A 24-year-old male presented to the Emergency Department with cough and hemoptysis. The patient had been spearfishing when his symptoms began. The patient had dove to a depth of 50 feet using 11 lbs of weights on his belt, holding his breath along the way. On the way to the surface, he developed chest pain. After getting onto the boat, the patient coughed up approximately 5 tablespoons of bright red blood. After feeling a bit better, he went down again to a depth of 30 feet in order to catch a large fish. After returning to his boat, the patient was still experiencing cough, pleuritic chest pain, and mild shortness of breath. On arrival to the emergency department, the patient was breathing comfortably on room air. He did not complain of any headache, visual changes, ear pain, nausea, joint or muscle pain, or any other symptoms. On exam, he was comfortable and his lungs were clear to auscultation bilaterally. The patient had no further hemoptysis after arrival to the emergency department. Given the patient’s chest pain and subjective shortness of breath, a chest x-ray was performed. 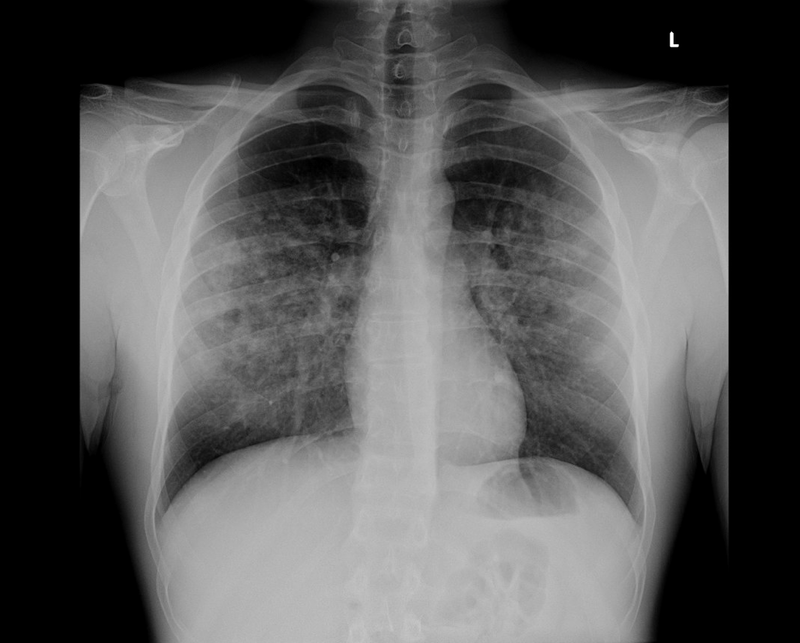 Chest X-ray notable for patchy, bilateral, midlung predominant airspace disease. The patient was placed on supplemental oxygen and was admitted to the medical ICU for close monitoring overnight. Pulmonology was consulted who recommended supportive care and repeat chest x-ray the following day. A CT scan of the chest was preformed to evaluate for any underlying pulmonary parenchymal disorders. A chest x-ray was completed the following morning in the medical ICU. Chest X-ray notable for grossly stable, patchy bilateral airspace disease that is midlung predominant. The patient remained hemodynamically stable and without respiratory distress throughout his hospitalization. He was discharged home on hospital day #2. Spearfishing may be done while freediving, snorkeling or SCUBA diving. Our patient and his friends were freediving, or breath-hold diving. Unlike SCUBA diving, breath-hold divers do not use supplemental air underwater. Divers face a unique set of underwater hazards in addition to the general aquatic problems; such as drowning, hypothermia, water-borne infectious diseases, and interactions with hazardous marine life. When diving deep, free divers are exposed to increased pressure, causing a spectrum of injuries to the body. Pressure contributes either directly or indirectly to the majority of serious diving-related medical problems. As a diver descends underwater, absolute pressure increases much faster than in air. The pressure change with increasing depth is linear, although the greatest relative change in pressure per unit of depth change occurs nearest the surface, where it doubles in the first 33 feet of sea water. The body behaves as a liquid and follows Pascal’s law; pressure applied to any part of a fluid is transmitted equally throughout the fluid. When a diver submerges, the force of the tremendous weight of the water above is exerted over the entire body. The body is relatively unaware of this change in pressure. 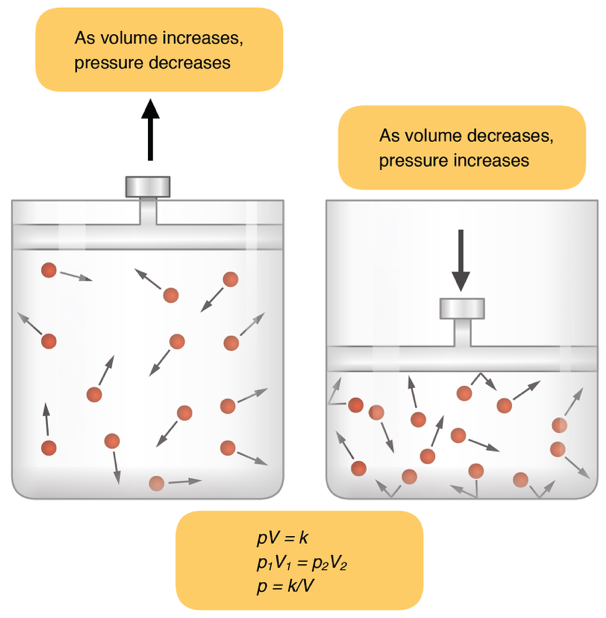 Pascal’s Law: pressure applied to any part of a fluid is transmitted equally throughout the fluid. This is true of the body, however the spaces within the body that contain air, including the lungs, sinuses, intestines, and middle ear follow a different law. The gases in these spaces obey Boyle's law; the pressure of a given quantity of gas at constant temperature varies inversely with its volume. Therefore, as you dive deeper, the volume of air in the middle ear, sinuses, lungs, and gastrointestinal tract is reduced. Inability to maintain gas pressure in these body spaces equal to the surrounding water pressure leads to barotrauma. Boyle’s Law: the pressure of a given quantity of gas at constant temperature varies inversely with its volume. Barotrauma can potentially involve any area with entrapment of gas in a closed space. In addition to sinuses, lungs and the GI tract, the barotrauma can occur to the external auditory canal, includes teeth, the portion of the face under a face mask, and skin trapped under a wrinkle in a dry suit. The tissue damage resulting from such pressure imbalance is commonly referred to as a “squeeze”. Given that our patient’s only complains were respiratory in nature; hemoptysis, shortness of breath, cough with deep breathing, we will focus on pulmonary barotrauma. Pressure related injury to lung can occur on the way down or as a diver ascends to the surface. Recall from physiology that if you were able to completely exhale, the absolute minimum lung volume remaining is called the residual volume (RV). Lung squeeze occurs when the when the diver descends to a depth at which the total lung volume is reduced to less than the residual volume. At this point, transpulmonic pressure exceeds intraalveolar pressure, causing transudation of fluid or blood from ruptured of pulmonary capillaries. (1) Patients exhibit signs of pulmonary edema and hypoxemia. As a diver ascends, the pressure within the alveoli of the lung increase as the pressure around the diver decreases. Remember Boyle’s law? 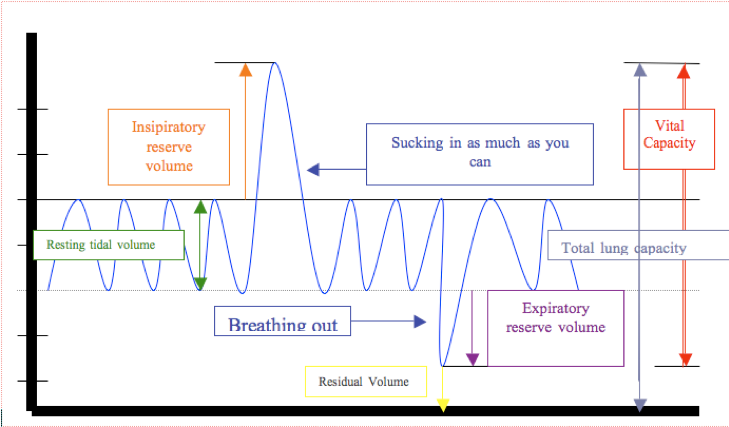 If intrapulmonary gas is trapped behind a closed glottis, as the diver ascends and the surrounding pressure decreases, the volume of the intrapulmonary gas increases. Increased pressure within the lung causes an increase in transalveolar pressure leading to overexpansion injury and alveolar rupture. (4) A situation of rapid ascent to the surface, such as if a diver runs out of air, panics, or drops his weights, is often the cause of pulmonary barotrauma of ascent. Divers who hold a breath as they ascend and those with obstructive airway diseases, such as asthma or chronic obstructive pulmonary disease, are at increased risk. This was likely the case with our patient, he did not exhale and relieve the building pressure as he ascended, causing his pulmonary barotrauma. Eventually, the intrapulmonary pressure rises so high that air is forced across the pulmonary capillary membrane. The specific clinical manifestations of pulmonary barotrauma depend on the amount of air that escapes the alveoli and location that it travels to. Air can rupture alveoli, causing localized pulmonary injury and alveolar hemorrhage. (4) Pulmonary interstitial air can dissect along bronchi to the mediastinum causing pneumomediastinum, the most common form of pulmonary barotrauma. This air can track superiorly to the neck, resulting in subcutaneous emphysema. Rarely, air may reach the visceral pleura, causing a pneumothorax. If air enters the pulmonary vasculature, it can travel to the heart and embolize to other parts of the body, causing arterial gas embolism (AGE). Clinical manifestations of cerebral air embolism are sudden and can be life-threatening. Approximately 4% of divers who suffer an AGE die immediately from Total occlusion of the central vascular bed with air. (5,6) AGE patients who make it to the hospital usually present with hemoconcentration due to plasma extravasation from endothelial injury. (7) The degree of hemoconcentration correlates with the neurologic outcome of the diver. (7) Creatinine kinase is elevated in cases of AGE and correlates with neurologic outcome of the diver. (8) All cases of AGE must be referred for hyperbaric oxygen treatment as rapidly as possible. (9) All suspected AGE patients should be referred for hyperbaric consultation, even if initial neurologic manifestations resolve prior to reaching an ED in order to prevent progression of subtle neurologic deficits that are not immediately detected. Our patient dove to a depth of 50 feet and reported holding his breath while resurfacing, therefore it is likely that he experienced pulmonary barotrauma of ascent. However, cases of lung squeeze have occurred with free diving to more shallow depths. (3) Regardless, the emergency department management of the spectrum of pulmonary barotrauma is similar. First of all, stop the dive! Ensure the safety of the injured diver and help them relax. Help the injured diver exit the water to prevent any strenuous physical activity. When available, have the diver breath 100% oxygen. Avoid exposure to pressures (such as flying or a repeat dive). On arrival to the ED, perform a complete history and physical. Evaluate for any signs of AGE, such as a transient episode of neurologic dysfunction immediately after surfacing. A diver with local pulmonary injury without any evidence of AGE does not require recompression and should be treated with supportive care, consisting of rest and supplemental oxygen in severe cases. Most diving-related pneumothoraces are small, therefore treatment may consist simply of supplemental oxygen and close observation. If the diver requires recompression, a chest tube must be placed in order to prevent a tension pneumothorax during depressurization from a hyperbaric chamber. Depending on where you practice, consider transferring the patient to a tertiary care facility if the clinical presentation is worsening, if there are further episodes of hemoptysis, or if the patient requires further testing, such as broncoscopy. To date, I have been unable to find any data that supports the use of steroids, diuretics, or other medications to treat this condition. Patients should rest for at least two weeks before resuming diving and preferably after being cleared fit to dive by a physician with knowledge of dive related injuries. Divers Alert Network (DAN) is a not-for-profit diving safety medical organization. DAN's medical staff is on call 24 hours a day, 365 days a year, to handle diving emergencies. They can be reached via DAN.org and through a medical hotline 1-919-684-9111. Pressure contributes to the majority of diving-related medical problems. The spaces within the body that contain air, including the lungs, sinuses, intestines, and middle ear obey Boyle's law; the pressure of a given quantity of gas at constant temperature varies inversely with its volume. As you dive deeper, air in the middle ear, sinuses, lungs, and gastrointestinal tract is reduced in volume. As you resurface, the pressure of the gas decreases and the volume expands. When breath-hold diving to deep depths, divers may experience “lung squeeze”, or transudation of fluid or blood from ruptured pulmonary capillaries causing non-cardiogenic pulmonary edema. On ascent, over distension causes alveolar rupture and may cause air to escape into an extraalveolar locations. Possible presentations are pneumomediastinum, subcutaneous emphysema, pneumothorax, or arterial gas embolization. Treatment usually consists of supportive care, rest, avoiding further exposure to pressures (flying or repeat dives), and supplemental oxygen when needed. Evaluate for any historical clues of physical exam findings suggestive of AGE as these patients require hyperbaric treatment. When in doubt, call the 24-hour Divers Alert Network (DAN) emergency medical hotline at 1-919-684-9111. Schaefer KE, Allison RD, Dougherty JH, Jr., et al. Pulmonary and circulatory adjustments determining the limits of depths in breathhold diving. Science 1968;162:1020-3. Raymond LW. Pulmonary barotrauma and related events in divers. Chest 1995;107:1648-52. Balk M, Goldman JM. Alveolar hemorrhage as a manifestation of pulmonary barotrauma after scuba diving. Ann Emerg Med 1990;19:930-4. Van Hoesen K., Lang, M. Diving Medicine. Auerbach’s Wilderness Medicine. 7th ed: Elsevier, Inc.; 2017:1583-618. Neuman TS, Jacoby I, Bove AA. Fatal pulmonary barotrauma due to obstruction of the central circulation with air. J Emerg Med 1998;16:413-7. Smith RM, Van Hoesen KB, Neuman TS. Arterial gas embolism and hemoconcentration. J Emerg Med 1994;12:147-53. Smith RM, Neuman TS. Elevation of serum creatine kinase in divers with arterial gas embolization. N Engl J Med 1994;330:19-24. Cales RH, Humphreys N, Pilmanis AA, Heilig RW. Cardiac arrest from gas embolism in scuba diving. Ann Emerg Med 1981;10:589-92. Welcome to the eighteenth episode of AEM Early Access, a FOAMed podcast collaboration between the Academic Emergency Medicine Journal and Brown Emergency Medicine. Each month, we'll give you digital open access to an recent AEM Article or Article in Press, with an author interview podcast and suggested supportive educational materials for EM learners. Multicenter Evaluation of the YEARS Criteria in Emergency Department Patients Evaluated for Pulmonary Embolism. Christopher Kabrhel MD,MPH Astrid Van Hylckama Vlieg PhD Alona Muzikanski MS Adam Singer MD Gregory J. Fermann MD Samuel Francis MD Alex Lim kakeng MD Ann Marie Chang MD Nicholas Giordano MA Blair Parry BA. It may be possible to safely rule out pulmonary embolism (PE) in patients with low pre‐test probability (PTP) using a higher than standard D‐dimer threshold. The YEARS criteria, which includes three questions from the Wells PE Score to identify low PTP patients and a variable D‐dimer threshold, was recently shown to decrease the need for imaging to rule out PE by 14% in a multicenter study in the Netherlands. However, the YEARS approach has not been studied in the United States. Prospective, observational study of consecutive adult patients evaluated for PE in 17 U.S. emergency departments. Prior to diagnostic testing, we collected the YEARS criteria: “Does the patient have clinical signs or symptoms of DVT?”, “Does the patient have hemoptysis?”, “Are alternative diagnoses less likely than PE?” with YEARS (+) being any “yes” response. A negative D‐dimer was <1000 mg/dL for YEARS (‐) patients, and <500 mg/dL for YEARS (+) patients. We calculated test characteristics and used Fisher's exact test to compare proportions of patients who would have been referred for imaging and patients who would have had PE “missed.”. Of 1789 patients, 84 (4%) had PE, 1134 (63%) were female, 1038 (58%) were White and mean age was 48 years. Using the standard D‐dimer threshold, 940 (53%) would not have had imaging, with 2 (0.2%, 95% CI: 0.02%, 0.60% “missed” PE. Using YEARS adjustment, 1204 (67%, 95% CI: 65%, 69%) would not have been referred for imaging, with 6 (0.5%, 95% CI: 0.18%, 1.1%) “missed” PE, and using “alternative diagnoses less likely than PE” adjustment, 1237 (69%, 95% CI: 67%, 71%) would not have had imaging with 6 (0.49%, 95% CI: 0.18%, 1.05%) “missed” PE. Sensitivity was 97.6% (95% CI: 91.7%‐99.7%) for the standard threshold, and 92.9% (95% CI: 85%‐97%) for both adjusted thresholds. NPV was nearly 100% for all approaches. D‐dimer adjustment based on pre‐test probability may result in a reduced need for imaging to evaluate possible PE, with some additional “missed” PE but no decrease in NPV.